Be careful what you put out in the universe! The other day I was in the car with my spouse and daughter and the two were making a comment I hadn’t blogged in awhile. I replied that I only write when I feel something funny has happened or I gain a new insight. The very next day I went and got my little friend Diesel for his daily morning constitutional, I put on his collar and off we went for our walk. We were about five minutes into our stroll when he saw a cat at the very end of the cul de sac we traverse along on our regular Sunday route. Diesel is overtly interested in anything feline, he finds them fascinating! He was utterly transfixed, even though the cat was no longer in his line of sight and had disappeared. As we neared the bottom of the street and were going to cross over to the other side, my dear friend kept looking left, and basically planted himself in the middle of the road and refused to move, staring in the direction that he remembered the cat had gone. I gave him a little tug and asked him to follow me, he stood firm, like a sack of cement. I turned to go right and gave another pull as we were standing in the middle of the street and much to my dismay I realized I had a leash in my hand, but no dog at the other end. Every once in awhile that dang pinch collar releases with absolutely no rhyme or reason as to why it does that? I think it just presses on Diesel’s neck in just the right way and his muscles pop it out, I have no clue, it’s a mystery that baffles me! What I do know, is that in the instance that I realized we were no longer tethered together, so did Diesel and that dang cat was sauntering across the road in plain sight taunting him. Opportunity was knocking and Diesel was ready to answer, he took off like a shot, boy can that dog move when he is motivated! My husband was walking our dog, and was a little bit ahead of us, he turned to see me, running down the middle of the road in a winter coat and Bogs (which let me tell you are not ergonomically designed for speed) trying to close a five house gap between me and Diesel. I was giving it my all trying to sprint, I remember yelling as I ran, “Run Kitty, run kitty….” A car had just turned onto the road and was coming towards us and I was worried it might strike the cat or Diesel, thankfully it went right. I worried that the cat might head towards the end of the street and lead my little buddy onto a road which is a major artery for traffic, there were many scenarios bouncing around in my head as I tore after the two animals. Thankfully, some higher power was watching out over us, as Diesel ran into a yard that just happened to have a picket fence around a portion of it, trapping him and allowing me to catch up. Neither the dog or I had any clue where the cat had gotten off to, and frankly as long as it wasn’t interfering with me getting a hold of my charge, I didn’t care! A few moments later my husband and our dog caught up to us. 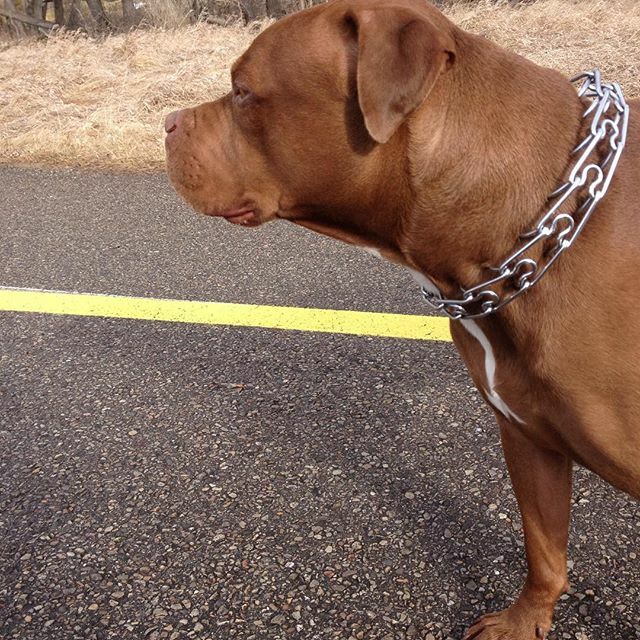 We got Diesel’s collar back on, tried to regain our composure and we resumed our walk. My spouse and I were short of breath, he has asthma and I haven’t run in over a year so my lungs were burning, the cold air didn’t help matters. As we progressed we both became very aware of our foot issues, he has gout and I have plantar fasciitis and I realized I had pulled something in my buttock region…heck, neither of us had really warmed up our muscles yet, and the current temperature was a balmy -11 that morning, not the best weather for sprinting when one is not prepared. I spent the remainder of the walk trying to come up with a fool proof system that would prevent collar and leash malfunctions, which seem to be happening a lot as of late with Diesel, I swear we have a mischievous Boggart (think Harry Potter) that is having some fun at my expense and wants to test my mental and physical agility, so far I have passed with flying colours with each scenario. It was an exciting morning…great blog fodder!! I will say though, I don’t require thrills, some mundane walks would suit me just fine! I think I am becoming known as the crazy dog walking lady that runs down the middle of the street chasing her charges! As for the cat, we were about 150 yards away when Diesel stopped dead in his tracks and looked back, there was that kitty again, sauntering across the road like he didn’t have a care in the world, completely unphased by the fact that he had just alluded a potential altercation with a dog. My take away that morning was all’s well that ends well! (For my sanity, Diesel, now has a collar as well as his pinch one, a double leash system connected to both and a carabiner as a safeguard keeping everything together, I have my fingers crossed I have all scenarios covered now).